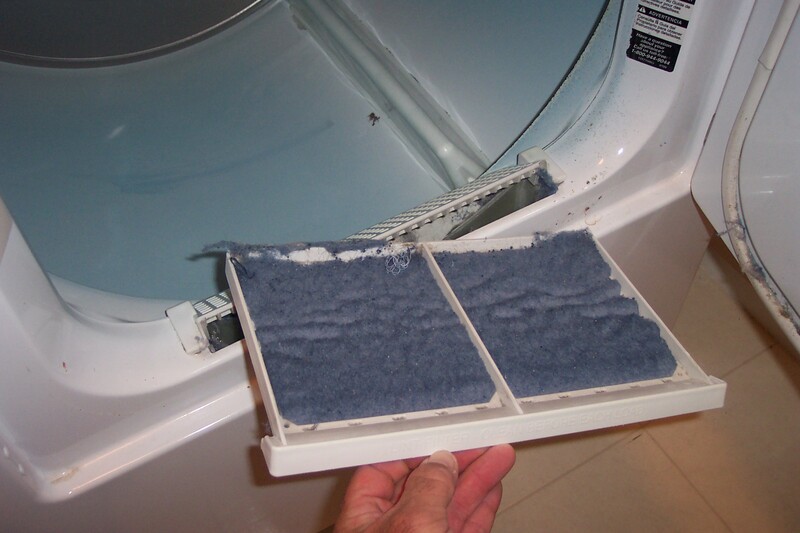 One of the easiest ways to keep your dryer running efficiently is to clean out its lint trap, screen and vent. Follow these easy steps to clean out the lint from your dryer and get it working efficiently. As always, when you’re working on any large appliance, make sure to unplug it first, or shut the power off to it from the breaker box. The Lint Trap and Screen – Depending on the design of your dryer the lint trap will either be on the top of the dryer or located just inside the door. Be sure to locate the dryer’s lint trap, which houses the lint screen, before continuing. 1. Remove the lint screen from the lint trap. Simply grab the end of the screen and give it a gentle pull. The screen should lift out fully from the dryer (see photo, above). 2. Clear the lint free from the screen. The trick here is to just get a small amount of lint to start with. Once you’ve scraped a small bit free from the screen use it to remove the remaining lint. Like a snowball rolling down hill, the lint will attract to itself and aid in the removing process. Once it’s removed, toss the lint into the garbage bag. 3. Use your vacuum cleaner and use a soft brush attachment to clean the screen. Turn on the vacuum and simply run the attachment over the screen. This will remove any remaining lint from the screen. 4. Now use the vacuum to remove any lint from the lint trap. Swap out the attachment on the vacuum for one with a longer neck. Once you’ve done that, turn on the vacuum and put the attachment as far into the lint trap as possible. Now work the attachment around the inside of the trap. The goal here is to remove any and as much of the residual lint as possible. Occasionally, you might want to pull the attachment out (since you won’t be able to see down the trap), and make sure the tip of the vacuum attachment is not clogged, which it often is. If so, just pull out the lint that’s clogging the attachment, put your hand against the end to check that it’s sucking clearly, and reinsert it into the trap. 5. Once the lint trap is clean, put the lint screen back into place. It’s as easy as it sounds, simply take the lint screen (now cleaned) and put it back into the cleaned lint trap. Depending on the design of your dryer, the vent will most likely be located on the back of the unit on either the top or bottom. Look behind the dryer to see how the lint vent is arranged–most often it’s a flexible aluminum tubing or aluminum piping. To access the vent, you’re more than likely going to have to pull the dryer away from the wall. Just make sure that there is nothing obstructing the tubing, or that the tubing is not pinched in a way that it will tear a hole in it from pulling it away from the wall. Caveat–if the dryer is an older gas version, you might want to see if there’s any way you can get to the lint vent without moving the dryer. Older connections are fragile, and jostling them can lead to gas leaks. Regardless, everything you’re doing with a gas dryer, if you smell gas, immediately stop, and call the public utility to come fix it. These are a mixed bag at best. They’re designed to keep heat in the home (as opposed to sending it out into the cold, cold world), which in theory is nice in the winter in cold climates. However, they’re not great for indoor air quality (especially if you happen to be drying synthetic, petroleum based clothing like athletic shirts). In addition, they can get in the way of cleaning the vent. Don’t get your linteater caught in one of these! 1. Remove the dryers vent from the wall. Typically, there is a metal ring clamp that attaches the tubing to the dryer and to the wall, and that you can loosen/tighten with a screwdriver (typically flat head). Once you loosen the clamp, the tubing should simply slide in and out of place around a pipe in the wall. Take two hands and gently pull on the tubing to remove it, making sure not to tear a hole anywhere. Do the same for the attachment on the dryer end, so that the tubing comes completely free of the wall and the appliance. 2. Clean both the vent and piping in the wall with your vent brush. Simply take the brush and work it as far into either the wall’s piping as possible. Once it’s as far in as it can be, gently pull the brush out of either the vent or piping. Be sure to turn the brush either clockwise or counter-clockwise while doing so. This will help to knock as much of the lint free as possible. With the tubing you’ve now removed, you should be able to hold it up vertically over a part of the ground that you don’t mind getting temporarily dirty, and insert your brush into the top to clean it out. By the time you remove the brush you should have a pile of lint on your floor. Repeat this process till you stop pulling lint from either the vent or piping. If you are using the LintEater to remove the lint buildup, you can insert it from this end, or from the outside end (see that link for instructions on how). 3. Take your vacuum and clear out any remaining lint. Sometimes the brush just can’t remove all of the lint from either the vent or piping. Take your vacuum and use the long attachment to clear out as much lint as possible. 4. Put the dryer’s vent back into place. Now that you’ve cleaned both the vent and piping, take the vent and slide it back into place, and tighten the screws on the clamp on each end to reaffix it firmly. 5. If possible, go outside and clean the other end of the vent. In some cases the outside of the vent may not be accessible. However, if it is, take your vent brush and repeat step 2 to pull as much lint from this end of the vent as possible. 6. Blow it out. Once all the tubing is put back together the way you found it (or better), turn the dryer on for 10-15 seconds. This will blow air out the tubing, which should flush all the lint that you just loosened out the other end of the pipe. Thanks to all of your hard work, your dryer should now be running more efficiently. Depending on how often you use your dryer, it’s probably a good idea to perform this service every six months to a year. If you are not the DIY type, you can hire out cleaning your dryer vent with an energy efficiency company. Here’s Green Living Ideas‘ tips for using your laundry washer and dryer efficiently. If you’re looking for more ways to save energy around your home, try installing a water efficient shower head or flow valve adapter. Also, be sure to check out our other green home improvement projects: Green Living Ideas, after all, is a top 20 home improvement website! Many of these energy efficiency services can be handled by a home-based efficiency company like Pono Home. Photo courtesy of More Change and Air Duct Cleaning.